Pitt’s Student Government Board held their “first real public meeting” for students Tuesday, according to President Max Kneis. Kneis opened the meeting with the president’s report, saying “new, younger lawyers from within the Oakland neighborhood” were hired as part of SGB’s legal services for undergraduate students. Students with legal issues can make an appointment through SGB to consult with one of the lawyers for free between 5-7 p.m. Thursday. 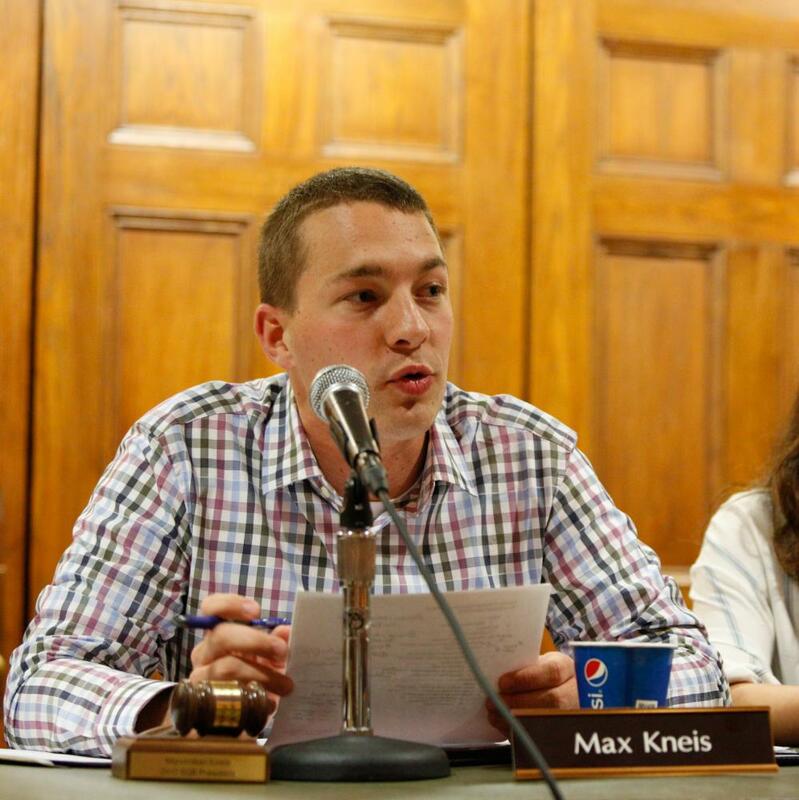 Kneis also spoke of his own personal projects for the year, including his mission to create a larger student presence in different organizations at Pitt, such as the Board of Trustees. “I want to get as many student voices involved in as many places at Pitt as possible,” Knies said. Board members spoke about their own projects for the year during their board reports. Executive Vice President Zuri Kent-Smith said he plans to create an artistic content hub for students of color. Ian Callahan introduced a plan plan to orchestrate a TedX chapter at Pitt this coming spring, and Vice President and Chief of Finance Maddy Guido discussed plans for a biology minor at Pitt. Guido said, as a biology major, she finds it strange that Pitt does not have a minor available in the field for students of other sciences. “I have friends in chemistry who have taken a lot of bio classes, and I don’t see why they can’t get recognition for the work they do,” Guido said. Guido said she plans to begin speaking with academic affairs to see how the University could achieve this. Nihita Manem spoke about her planned work with “Grub Club,” an organization she said will allow students to meet and speak directly with people in charge of Pitt’s dining services on a regular basis about the changes they want to see. Alex Spenceley announced the dates for Mental Health Week at the University, which will be Oct. 16 to 20. Ami Fall said she will assist Spenceley with organizing the events for Mental Health week, including a poetry slam, a self-care fair and diversity roundtables. The board introduced two new bills during the meeting. B.B.046 was approved, which further incorporated the position of communications director into the governing code and also updated it to have more inclusive language. B.B.047 was also approved to better define the relationship of the Student Office of Sustainability director as a liaison to SBG on environmentally and socially equitable projects. Kneis closed off the meeting by wishing good luck to the University football team on its game this Saturday. “I’d like to wish them the best when they beat Penn State,” he said. Active Minds requested $8,745.86 for a guest speaker to share their experiences with the group. The Board approved the request in full. The Biomedical Engineering Society requested $1,900 for its organization’s annual conference. The Board approved the request in full. The American Medical Student Association requested $1,882.47 to attend the UC-Davis Pre-Health Conference conference. The Board approved the request in full. The American Institute of Chemical Engineers requested $2,000 for its organization’s national conference. The Board approved the request in full. ChemE Car requested $4,486.92 to attend the national AIChE to compete in the ChemE car competition. The Board approved the request in full. The Women’s Rugby Club requested $480.00 for a program expense.The Board approved the request in full. The Women’s Rugby Club requested $150.00 for a purchase and rental expense. The Board denied the request in full. The Women’s Rugby Club requested $3,287.20 for travel to a competition. The Board approved the request in full. The Panther Wrestling Club requested $73.61 for a program expense.The Board denied the request in full. Theta Tau requested $1,925.00 for a purchase and rental expense. The Board approved the request in full. Theta Tau requested $200.20 for travel to a contest. The Board approved $158.60 and denied $41.60. The Redeye Theatre Project requested $1,070 for a program expense. The Board approved the request in full. Pitt Tonight requested $250.00 for a purchase and rental expense. The Board approved the request in full. Panther Belly Dancers requested $600.00 for a purchase and rental expense. The Board approved the request in full. Club Football requested $1,325 for its NCFA league dues. The Board approved the request in full. The Chinese Language and Culture Club requested $232.00 for travel to a conference. The Board approved the request in full. Editor’s note: This story was updated Wednesday with more specific details regarding some of the allocations requests.